LaGrange, GA -- During a board meeting held at the LaGrange-Troup County Chamber of Commerce, the Georgia Ports Authority recognized a decade of partnership between Kia Motors Manufacturing Georgia and GPA. "Kia is one of our largest customers at the Port of Savannah, and a stellar example of the kind of advanced manufacturing going on across Georgia," said GPA Executive Director Griff Lynch. "At Georgia Ports, we are proud to support the positive impact Kia has on the state's economy." Over the past decade, the automaker has shipped nearly 350,000 twenty-foot equivalent container units through the Port of Savannah in support of its manufacturing plant near West Point, Ga. As one of GPA's largest container customers, Kia's volumes support thousands ofjobs throughout Georgia's transportation and logistics supply chain. Brunswick, GA — The first of Kia's new Telluride vehicles were loaded for export onto the Roll-on/Roll-off vessel Sirius at the Port of Brunswick. The 8-person SUVs are destined for ports around the Arabian Peninsula. "The Telluride is a bold, capable new offering, and the largest Kia ever," said Stuart Countess, chief administrative officer and vice president of Kia Motors Manufacturing Georgia (KMMG). "For KMMG, it's the logical next step in our commitment to meeting U.S. and global demand." Atlanta, GA — Governor Brian P. Kemp announced that Boehringer Ingelheim Animal Health USA Inc., a leading animal health company, will create 225 jobs and invest more than $120 million in Gwinnett, Clarke, and Hall counties. The company has located its North American headquarters in Duluth, creating 75 new jobs; is adding more than 100 new jobs at its manufacturing and R&D facility in Athens; and more than 50 jobs at the company’s Gainesville manufacturing facility. Savannah, GA — At the Georgia Foreign Trade Conference today, Stuart Countess, chief administrative officer and vice president of Kia Motors Manufacturing Georgia, announced that the Telluride, its new 8-person SUV, will begin crossing the Port of Brunswick's docks for global markets this month. "The launch of the Kia Telluride, our largest and most refined SUV to date, will be a monumental achievement for KMMG," said Countess. "From the support we receive from GPA with our inbound parts from our global supply chain to supporting our export of finished vehicles to current and future markets, GPA will play an important role." Savannah, GA — At the Georgia Foreign Trade Conference, Georgia Ports Authority Executive Director Griff Lynch unveiled GPA's Big Berth/Big Ship program that will allow the Port of Savannah to simultaneously handle six 14,000 TEU vessels by 2024. During his presentation titled "2019: The Triple Crown?" Lynch told an audience of 350 logistics professionals that the Port of Savannah had just last week achieved the busiest month ever in its history, moving 433,975 TEUs, a whopping 28 percent jump over the previous year. Savannah, GA — The Port of Savannah moved 4.35 million twenty-foot equivalent container units in Calendar Year 2018, its highest annual volume ever, and a 7.5 percent increase over 2017, according to a report from Georgia Ports Authority Executive Director Griff Lynch to the GPA Board Tuesday. "The level of business Georgia has captured is a testament to the world-class service provided by our stevedores, ILA, pilots, other port stakeholders, and our partners at Coast Guard and Customs and Border Protection," said GPA Executive Director Griff Lynch. "Georgia's unrivaled connectivity to Atlanta, Memphis, Charlotte and beyond allows port customers to reach new and growing markets." Cobb County, GA — Governor Nathan Deal announced that BioIQ, a health IT company, will create 500 jobs and invest more than $5 million in Cobb County through the location of its new headquarters. New jobs will include positions in technology, sales and operations. Swainsboro, GA — Governor Nathan Deal announced that Wincore Window Company LLC, a leading American manufacturer of premium vinyl windows and fiberglass entry door systems, will create 150 new jobs and invest $6.5 million in a manufacturing facility in Swainsboro. Savannah, GA — The Georgia Ports Authority (GPA) moved 375,833 Twenty-foot Equivalent Unit containers (TEUs) in August, an eight percent increase over August 2017. In addition, the GPA handled 86,200 intermodal TEUs, a 33 percent jump. "A strengthening economy and a greater reliance on GPA in major inland markets is driving growth at the Port of Savannah," said GPA Executive Director Griff Lynch. "We expect this trend to continue as more customers take advantage of Garden City Terminal's central location and efficient terminal operations." Covington, GA — Governor Nathan Deal announced that Nisshinbo Automotive Manufacturing, Inc. (NAMI), a leading manufacturer and supplier of environmentally friendly brake pads, will create 100 jobs and invest $72 million in an expansion of its Covington facility. New jobs at the facility will include positions in production and administration. Smyrna, GA -- Governor Nathan Deal announced that the Northwest Corridor Express Lanes will open to southbound traffic mid-morning on Saturday, September 8. This infrastructure project, the largest of its kind in state history, adds approximately 30 miles of express lanes along I-75 from Akers Mill Road to Hickory Grove Road, and along I-575 from I-75 to Sixes Road. The first 14 days of operation will be free for motorists with registered Peach Passes to encourage commuters to utilize the express lanes. More information about the Northwest Corridor Express Lanes is available here. Chatham County, GA — Governor Nathan Deal announced that Jaguar Land Rover Classic will create 75 jobs in Chatham County. The new operations hub in Savannah will be Jaguar Land Rover Classic’s first facility in the U.S.
Savannah, GA — The Georgia Ports Authority moved 378,767 twenty-foot equivalent container units (TEUS) in July, an increase of 12.7 percent, or 42,668 TEUs, compared to the same month last year. It was the second busiest month on record for the Port of Savannah. "July was an incredible start to our fiscal year, with double-digit growth across our container, breakbulk and dry bulk operations," said GPA Executive Director Griff Lynch. Atlanta, GA — Governor Nathan Deal announced that Hanwha Q CELLS Korea, a leader in the global solar industry, will create more than 500 jobs and invest $150 million in a new solar module manufacturing facility in Dalton. Savannah, GA -- Governor Nathan Deal today announced that Georgia’s net tax collections for July, the first month of FY 2019, totaled nearly $1.78 billion, for an increase of $59.4 million, or 3.5 percent, compared to last year when net tax collections totaled almost $1.72 billion. July’s gross tax revenue receipts totaled $2.41 billion, for an increase of $136 million, or 6 percent, over July 2017. Individual Income Tax: Individual Income Tax collections for July totaled $897.1 million, for an increase of $35.6 million, or 4.1 percent, compared to last year when Individual Income Tax collections totaled $861.5 million. Savannah, GA -- Governor Nathan Deal announced that the Georgia Department of Economic Development’s (GDEcD) Global Commerce Division helped create a total of 27,373 new jobs during FY 18, generating $5.56 billion in investments. This growth is the result of a record-breaking 419 expansion or relocation projects throughout the state. “Industry leaders and companies from around the world continue to choose Georgia thanks to the world-class, business-friendly environment we have built over the last eight years,” said Deal. “Georgia’s unparalleled resources, including our highly skilled workforce and our physical and digital infrastructure, continue to attract international companies that are planning to expand or relocate. These numbers reflect Georgia’s appeal to global job creators and translate to real economic growth in our communities and new job opportunities for families across the state. Nearly 80 percent of these projects brought investments to communities outside of the metro Atlanta area, demonstrating the depth of talent, investment and connectivity available in every corner of the state. Dalton, GA -- Governor Nathan Deal announced that Hanwha Q CELLS Korea, a leader in the global solar industry, will create more than 500 jobs and invest $150 million in a new solar module manufacturing facility in Dalton. Valdosta, GA -- The Valdosta-Lowndes County Development Authority (VLCDA) announced that Metal Benderz, a Georgia-based company that designs, engineers, manufactures, and fabricates cold-formed steel framing systems will be relocating to Hahira Business Park. Atlanta, GA — Governor Nathan Deal announced that Pandora, the largest music streaming service in the U.S., will expand its presence and create 250 jobs in Atlanta over the next three years. Atlanta, GA — Governor Nathan Deal announced that InComm, a leading prepaid product and payment technology company based in Atlanta, will create more than 150 jobs and invest over $20 million in capital developments in metro Atlanta and Columbus. Savannah, GA — Governor Nathan Deal announced that Gulfstream Aerospace Corp., the world’s leading business jet manufacturer, will create 200 jobs and invest $55 million in an expansion of its service center operations in Savannah. New jobs will include positions in Gulfstream’s service and support organization. Atlanta, GA — Southern Telecom, Inc. (STI), a subsidiary of Southern Company, announces Georgia System Operations Corporation (GSOC) has entered a leasing agreement for dark fiber on STI’s Atlanta central business district fiber ring. GSOC is utilizing the fiber to connect the cooperative’s headquarters office in Tucker, Georgia, to Georgia EMC’s government relations, community and economic development office, located on the Georgia Tech campus in downtown Atlanta. “Utilizing Southern Telecom’s fiber network has helped GSOC streamline our internal operations between our headquarters office and our affiliate Georgia EMC’s office, including our data management, phone systems and business tools,” says Bilal Sabusa, Director of Technology and Operations for GSOC. Savannah, GA — The Georgia Ports Authority broke ground on its $126.7 million Mason Mega Rail Terminal. The expansion will increase the Port of Savannah’s rail lift capacity to 1 million containers per year, and open new markets spanning an arc of cities from Memphis to St. Louis, Chicago to Cincinnati. Savannah, GA — Governor Nathan Deal, along with Lt. Gov. Casey Cagle and House Speaker David Ralston, outlined updates to HB 918, which addresses state tax code. The legislation, sponsored by Rep. Chuck Efstration, now combines the 2017 Internal Revenue Code (IRC) bill, HB 821, with 2018 IRC updates. It also addresses the state revenue projections resulting from the Federal Tax Act. “I am encouraged to see that SHEP was President Trump’s top priority when it comes to port investments,” said Deal. “The expansion of the Port of Savannah is the single most important infrastructure project not only for Georgia, but for the Southeast as a whole, and deepening it is necessary to allow larger ships like the Neo-Panamax to navigate through our ports more quickly and ensure that a greater volume of goods will be able to move through our state. Savannah, GA — At the 50th annual Georgia Foreign Trade Conference Monday, GPA Executive Director Griff Lynch reviewed the strategic plan for Georgia's ports that will allow for 10 million twenty-foot equivalent container units, 1 million rail lifts, and more than 1 million auto and machinery units per year. Lynch provided an overview of GPA's 2028 Plan that calls for 42 ship-to-shore cranes, 200 yard cranes, new RTG lanes and significant intermodal expansion in Savannah. The GPA will soon open its second inland terminal in Northwest Georgia and break ground on the Mason Mega Rail project at Garden City Terminal. Combined, both intermodal projects will open new markets while significantly reducing rail crossings and over the road freight through Savannah, Atlanta and beyond. Savannah, GA - Four additional Neo-Panamax cranes sailed into the Port of Savannah last week, with a 50- by 100-foot American flag across the side. "To see these massive new cranes arrive flying the stars and stripes makes us proud to be part of an operation that provides jobs and opportunity for so many," said Georgia Ports Authority Executive Director Griff Lynch. Once commissioned, the new cranes will bring Savannah's fleet to 30. Six additional cranes will arrive in 2020. When all are commissioned, the upgrade will allowthe nation's largest single container facility to move nearly 1,300 containers per hour. Savannah, GA — Container trade at the Port of Savannah grew by 32 percent in October, with Garden City Terminal moving 410,000 twenty-foot equivalent container units, an increase of nearly 100,000 TEUs. It was the first time in the port's history that it topped 400,000 TEUs in a single month. For the fiscal year to date (July 1-Oct. 31), the Port of Savannah has moved 1.42 million TEUs, up by 155,050 or 12.3 percent. "Since the opening of the expanded Panama Canal, Garden City Terminal has experienced meteoric growth," said GPA Executive Director Griff Lynch. "We're now handling more ships, bigger vessels and larger cargo exchanges. By working more weekly vessel calls than any other East Coast port, and serving more neopanamax ships than any other port in the U.S. Southeast, Savannah has strengthened its position as a vital gateway to the global marketplace." Savannah, GA — American Honda Motor Company nearly tripled its business through the Port of Brunswick in Fiscal Year 2017, adding 34,700 vehicles over the previous year. "We'd like to thank Honda and International Auto Processors for their part in helping GPA move more than 600,000 vehicles through the Port of Brunswick last fiscal year," said Georgia Ports Authority Executive Director Griff Lynch. "To ensure Brunswick continues to provide world-class service, GPA is expanding auto processing infrastructure to stay ahead of demand." Valdosta, Georgia — Martin’s Famous Pastry Shoppe, Inc.®, home of the number one branded hamburger roll in the United States, is expanding their bakery in Valdosta-Lowndes County, Georgia, to add additional production capacity. Martin’s Famous Pastry Shoppe, Inc., has been known for their continual pursuit of a higher level of service and best practices in the baking industry. The upcoming construction project includes a major expansion of the bakery. “Martin’s expansion in our community will account for a multimillion-dollar capital investment, adding an estimated 36 new jobs with continued market growth,” said Andrea Schruijer, executive director of the Valdosta-Lowndes County Development Authority. “Martin’s Famous Pastry Shoppe, Inc., is an example of the positive economic impact companies have here in Valdosta-Lowndes County. We are thrilled they are expanding,” said Schruijer. Savannah, GA — The Port of Savannah moved more than 1 million twenty-foot equivalent container units across Garden City Terminal in the first quarter of FY2018 (July 1-Sept. 30), growing by 5.8 percent or 55,629 TEUs over the same period in FY17. In September alone, the GPA moved 325,141 TEUs, an increase of 5.4 percent or 16,792 TEUs compared to the same month last year. "Sustained organic growth coupled with increased market share are driving these volume increases," said GPA Executive Director Griff Lynch. "We have also achieved major gains through the addition of Neo-Panamax vessels to the fleet serving Garden City Terminal." Savannah, GA — During his annual State of the Port Address, Georgia Ports Authority Executive Director Griff Lynch announced record cargo volumes, infrastructure development and two new customers bringing a combined 1 million square feet of additional distribution center space to Savannah. "We're expanding on all fronts," Lynch said. "We're adding market share through organic growth and the addition of new accounts, and we're building the new infrastructure necessary to continue processing this cargo with world-class efficiency." Fulton County, GA — Governor Nathan Deal announced that ASOS, a leading online global fashion and beauty retailer, will establish an East Coast eCommerce fulfillment center in Union City, creating more than 1,600 jobs and investing more than $40 million in Fulton County throughout the next five years. In the first phase of development, the fulfillment center will have a 10 million-unit capacity with additional room for future growth. Atlanta, GA -- Governor Nathan Deal announced the launch of the Georgia Defense Exchange (GDX), an interactive business development platform designed to assist Georgia businesses in finding new opportunities in Department of Defense (DOD) contracting. Savannah, GA -- At its July board meeting, the Georgia Ports Authority reported record fiscal year results and approved the purchase of six new ship-to-shore cranes. In FY2017, the GPA moved an all-time high of 3.85 million twenty-foot equivalent container units, an increase of 6.7 percent, or 242,221 TEUs over the previous year. In the last half of FY2017 alone, the Port of Savannah handled an impressive 1.99 million TEUs, for a growth rate of 11.6 percent over the same period in FY2016. Valdosta, GA -- Hunt Industries, a full-service provider of high-quality specialty construction and general contracting services for industrial projects is expanding its operations in Valdosta-Lowndes County, Georgia. This expansion will create 30 new jobs, and represent a capital investment of $5 million. “Valdosta-Lowndes County is proud to be home to Hunt Industries and thrilled they are expanding in our community”, said Tom Call, chairman of the Valdosta-Lowndes County Development Authority. “Investments into job creation in Valdosta and Lowndes County is important, because it enhances to the economic vitality of our community”, said Call. Atlanta, GA -- Governor Nathan Deal, along with Georgia Department of Transportation (GDOT) Commissioner Russell McMurry and State Transportation Board Chairman Robert L. Brown Jr., announced the reopening of I-85, six weeks after a March 30 fire and bridge collapse closed the corridor. The northbound and southbound lanes of the I-85 bridge over Piedmont Road in Metro Atlanta are projected to open to traffic by morning rush hour on May 15. The new opening date is nearly two weeks earlier than GDOT’s most recent commitment of Memorial Day weekend, and five weeks ahead of the original projected opening date of June 15. State of Georgia — Governor Nathan Deal held budget signing ceremonies across the state for next year’s $25 billion state budget. The legislation, HB 44, will support Georgia citizens by funding initiatives in education, human services, public safety, state infrastructure and other key areas. This budget is based on a 3.5 percent increase in general fund revenues over FY 2017, reflecting Georgia’s sustained economic growth. “The FY 2018 budget maintains Georgia’s position as a national leader in conservative fiscal management and further strengthens our top priorities: quality education for all children, public safety in our communities, an economy that continues to generate jobs and an infrastructure system that supports a growing population,” said Deal. “With this budget, we are working to make Georgia a better place to live, work and play by investing in public safety personnel, teachers and others responsible for ensuring the safety of Georgia’s children. Savannah, GA — The Georgia Ports Authority has commissioned the first of four new Neo-Panamax ship-to-shore cranes at the Garden City Terminal, bringing its fleet to 23 -- more cranes than any other U.S. terminal -- with three machines yet to come online. "Expanding our capabilities means we are able to grow along with our customers, and adjust to changes in the logistics marketplace, such as increasing vessel sizes," said GPA Chief Operating Officer Ed McCarthy. The agreement encourages voluntary cooperation in the areas of operational and supply chain efficiencies, safety, communications and customer service. “The U.S. East Coast continues to see larger vessels and cargo exchanges since the opening of the expanded Panama Canal last year,” VPA CEO and Executive Director John Reinhart and GPA Executive Director Griff Lynch said in a joint statement. “Increasingly, our customers are seeking gateway ports on the East Coast that can leverage sufficient landside infrastructure to ensure the free flow of cargo. The agreement will enable the member ports to work together to find ways to become more efficient and effective, which will benefit the citizens of their respective states, as well as shippers and the carriers. Additional areas of cooperation between the GPA and VPA include acquisition and utilization of joint marketing materials and sharing best practices in areas such as terminal operating systems, training, cargo handling, access, turn-times and infrastructure, as well as supporting the promotion of all-water routes from the U.S. East Coast to the international marketplace via the Panama Canal. Georgia and Virginia are not the first terminal operators to file with the FMC to share information. In December 2016, APM Terminals, DP World, Hutchinson Port Holdings, PSA International, Shanghai International Port (Group) Co., and the Port of Rotterdam Authority filed the “Global Ports Group Agreement” with the Federal Maritime Commission to promote the efficiency and effectiveness of the container port industry. Find print-quality portraits of Griff Lynch and John Reinhart here. Georgia's deepwater ports and inland barge terminals support more than 369,000 jobs throughout the state annually and contribute $20.4 billion in income, $84.1 billion in revenue and $2.3 billion in state and local taxes to Georgia's economy. The Port of Savannah handled 8.2 percent of the U.S. containerized cargo volume and 10.3 percent of all U.S. containerized exports in CY2015. The Virginia Port Authority (VPA) is a political subdivision of the Commonwealth of Virginia. The VPA owns and through its private operating subsidiary, Virginia International Terminals, LLC (VIT), operates four general cargo facilities Norfolk International Terminals, Portsmouth Marine Terminal, Newport News Marine Terminal and the Virginia Inland Port in Warren County. The VPA leases Virginia International Gateway and Richmond Marine Terminal. In fiscal year 2013, The Port of Virginia provided more than 374,000 jobs and generated $60.3 billion in total economic impact throughout the Commonwealth. Savannah, GA —- The Georgia Ports Authority achieved outstanding January results, with double-digit growth across all business sectors and a 26 percent increase in total tonnage. 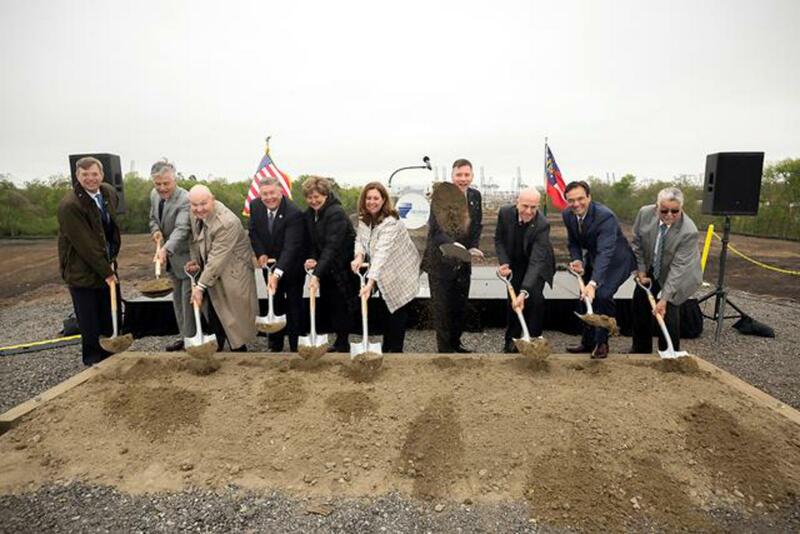 "The Port of Savannah is unrivaled in its connectivity into the heartland of the U.S. and the service excellence that port customers enjoy," said GPA Executive Director Griff Lynch. "With on-terminal efficiencies bolstered by interstates within minutes of the port and the fastest westward rail transit in the South Atlantic region, Garden City Terminal provides more reliable, more cost effective freight movement." Lynch credited those supply chain efficiencies for the record 3 million tons of cargo GPA moved in January, up 623,504 tons compared to the same month a year ago. Atlanta, GA — The Georgia Department of Economic Development (GDEcD) announced that ELK Group International (ELK), a premier designer and importer of indoor and outdoor, residential and commercial lighting fixtures and home decor, will create more than 100 jobs and invest $2 million in a distribution center in Screven County. Photo Caption: Developers have purchased five parcels, totaling 500 acres, within the Savannah River International Trade Park for warehousing and distribution operations. Find print quality images here. Savannah, GA -- The Georgia Ports Authority announced the sale of 500 acres of property for commercial development to accommodate growing customer demand for warehousing, distribution and transload facilities near the Port of Savannah. The new development, located on five parcels of land at GPA's Savannah River International Trade Park, is less than five miles from the Garden City Container Terminal and can accommodate up to 5 million square feet of logistics space. Atlanta, GA — The 2017 International Production & Processing Expo (IPPE) has more than 31,000 poultry, meat and feed industry leader attendees from all over the world. In addition, the show has more than 533,000 of net square feet of exhibit space and 1,275 exhibitors. Final numbers will be released next week. Sponsored by the U.S. Poultry & Egg Association, American Feed Industry Association and North American Meat Institute, IPPE is the world's largest annual feed, meat and poultry industry event of its kind. “This year’s tremendous exhibit floor and attendee and exhibitor numbers are a compliment to IPPE’s unmatched education programs, ample networking opportunities and diverse exhibits. The excitement and energy displayed by this year’s attendees and exhibitors will continue to safeguard the success and growth of future IPPEs,” the three organizations said. Savannah, GA — The Georgia Ports Authority marked 12.3 percent container volume growth in December, moving 292,172 twenty-foot equivalent container units, an increase of 32,099 TEUs compared to December 2015, a record for the GPA. 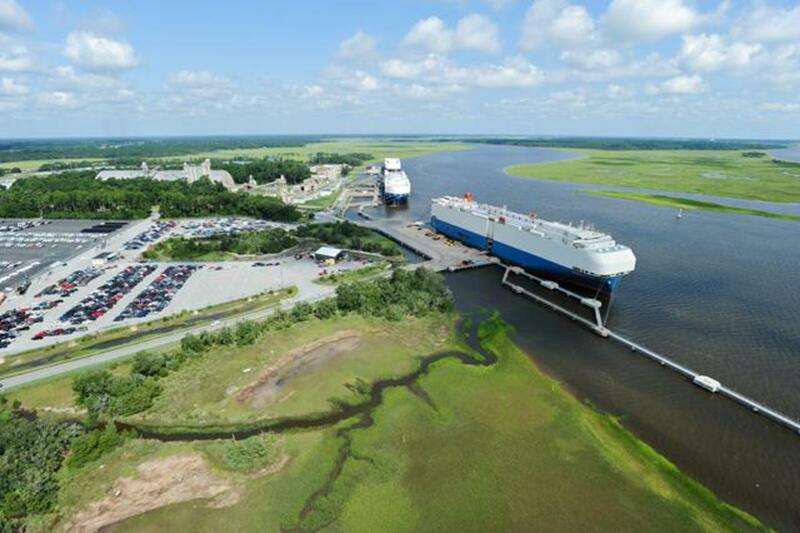 Roll-on/Roll-off cargo mirrored that growth, with a 12.3 percent increase (7,000 units) in passenger vehicles and heavy equipment handled at Colonel's Island terminal in Brunswick and Ocean Terminal in Savannah. Georgia's deepwater ports moved 63,967 Ro/Ro units last month. Executive Director Griff Lynch reported at the Authority board meeting Monday that several factors led to GPA's December record growth. "Strategic proximity to major population and manufacturing sites, direct interstate access and the most ocean carrier routes in the U.S. Southeast are the competitive advantages drawing customers to our ports," Lynch said. "As the largest single-terminal operation in the nation, Savannah's advantages are unmatched in the industry." Atlanta, GA — The Austin Company (www.theaustin.com), a leading design, engineering, construction and location consulting firm headquartered in Cleveland, Ohio, recently announced the promotion of Duane Lofdahl to Vice President and General Manager of The Austin Company Atlanta Operations. Duane’s career with The Austin Company began in Cleveland’s General Department in 1989 as the Director of Design for newspaper facilities, where he assisted all offices in the U.S., Canada, U.K. and South America with the planning and design of newspaper facilities. In 1995, Duane moved to Atlanta as the Manager of Facilities Development for the southeast, but continued to support all offices with newspaper facility design. Duane became a Vice President of Planning and Design and Senior Project Manager in 2005, with his first major project managing the design and construction of Valpak/Cox Target Media’s $55MM headquarters, production and distribution facility in Clearwater, Florida. In 2008, Duane served as Senior Project Manager for projects with Florida Power & Light in Homestead, Florida, and Hills Pet Nutrition in Emporia, Kansas. In 2012, Duane served as Senior Project Manager for the Newsweb project in Chicago, Illinois. Savannah, GA -- The Savannah River channel reopened for commercial traffic Wednesday morning at 7 a.m. with 11 vessels transiting the channel by mid-afternoon, nine of which will be worked at Garden City Terminal and two at Ocean Terminal. "Georgia's ports are now fully operational which is a testament to the efforts of countless individuals to ensure our port customers experienced minimal impact," said Griff Lynch, Executive Director for the Georgia Ports Authority. "We would like to thank our many service providers, port stakeholders, first responders, GPA employees and Governor Nathan Deal's Office for working around the clock to bring the ports of Brunswick and Savannah back online so quickly." By the end of the day, the Garden City Terminal was working nine vessels, moving nearly 800 containers per hour, with an anticipated 7,800 container moves for the day. Brunswick, GA -- At the annual State of the Port address hosted by the Brunswick-Golden Isles Chamber of Commerce Wednesday, Georgia Ports Authority Executive Director Griff Lynch announced a 100-acre expansion of the Colonel's Island auto terminal, and welcomed Logistec's announcement of the completion of 221,000 square feet of wood pellet storage at GPA's East River Terminal. "The additional 100 acres will allow GPA to grow along with our existing customers, and to attract additional carmakers to the nation's second busiest auto port," Lynch said. "This new roll-on/roll-off capacity is part of an initiative to service a growing market, while staying 20 percent ahead of our current demand." Duluth, GA -- thredup.com, the leading online marketplace to buy and sell secondhand women’s and kids’ clothing, celebrated the Grand Opening of its new distribution center 2670 Breckinridge Blvd. in Duluth, Georgia with an official ribbon-cutting ceremony hosted by Gwinnett Chamber of Commerce and attended by state and local officials. Speakers at the event included thredUP COO, John Voris and SVP, Gwinnett Chamber Economic Development, Nick Masino. Savannah, GA -- At its July board meeting, the Georgia Ports Authority approved a spending package of $19.7 million to construct the Appalachian Regional Port in Chatsworth, Murray County, Georgia. "We would like to thank our Board of Directors, Governor Deal, the state of Georgia, Murray County and CSX Transportation for making this incredible partnership possible," said Executive Director Griff Lynch. "The Appalachian Regional Port (ARP) will create a new gateway to the Port of Savannah for our customers serving Georgia, Alabama, Tennessee, Kentucky and beyond. Savannah, GA -- The MOL Benefactor is the first vessel to call on Savannah through the new locks of the expanded Panama Canal. At a capacity of 10,100 twenty-foot equivalent container units, the Benefactor is also the largest ship ever to call the Port of Savannah. The massive container ship, scheduled to move over 3,000 containers at GPA's Garden City terminal, is also the first Savannah call of the G6 Alliance's new NYX service. The East Coast rotation of the new service includes the ports of New York/New Jersey, Virginia and Savannah, exclusively deploying vessels in the 10,000-TEU range. Savannah, GA -- The Georgia Ports Authority has received a $44 million Fixing America's Surface Transportation (FAST) grant from the U.S. Department of Transportation to increase rail capacity at the Port of Savannah. "I would like to thank the Georgia Congressional delegation, including Congressmen Buddy Carter and Rob Woodall, and Senators Johnny Isakson and David Perdue, for their dedicated support of this program," said GPA Executive Director Griff Lynch. "As the nation's fourth busiest container port, Savannah's continued rail expansion is a key component to freight mobility in this country. This transformative project will not only increase rail capacity and velocity at the Garden City Container Terminal, but will also provide substantial benefits to surrounding communities by improving public safety, reducing environmental impacts and avoiding commuter traffic." Cartersville, GA -- Shaw Industries Group Inc. (Shaw) broke ground on its three-story, 67,000 square foot Create Centre in Cartersville, Ga. on Friday, June 24. Scheduled for completion in late 2017, the Centre will house the commercial division’s marketing, design and innovation associates – including its Patcraft and Shaw Contract teams. Savannah, GA -- The Georgia Ports Authority has received a 2016 EPA Clean Air Excellence Award for its electric rubber-tired gantry crane program that will transfer its container handling equipment from diesel to electric power. In 2012, GPA began to implement the electric rubber tired gantry crane program. By the end of August, 45 will have been transitioned from diesel to electric power or purchased with electric power capability, bringing GPA's eRTG fleet to 30 percent of the total. This cutting-edge technology, built to a GPA design, is the first eRTG installation of its kind at a port in North America. Atlanta, GA -- Gov. Nathan Deal announced that GE Digital will establish its first global Digital Operations Center in Atlanta. This project will create 250 jobs and represents an investment of approximately $3 million in the local community. The project began in July 2015, when the Horton Homes was pending the loss of their manufacturing facilities to a judicial tax sale. “Even though we were facing a terrible loss of our once largest employer in the county, the Putnam Development Authority recognized the opportunity that locating another mobile home manufacturer at the vacant plant would help replace lost jobs,” recalled Terry Schwindler, Economic Development Director of the Putnam Development Authority. Savannah, Ga. - April 27, 2016 - Investors are adding industrial space to meet booming demand in Savannah, with more than 1.7 million square feet of warehousing recently completed, more than 1.9 million square feet under construction, and a 2,700-acre development just announced. The investments mean additional jobs, and room for port customers to grow in the Southeastern U.S.
Atlanta GA -- Gov. Nathan Deal announced that Mohawk Industries, the world’s largest flooring manufacturer, will expand its existing vinyl flooring operations in Dalton-Whitfield County. This project will significantly increase the company’s current U.S. luxury vinyl tile (LVT) manufacturing capacity. The $100 million capital investment in infrastructure and equipment will generate approximately 200 jobs for the region. Savannah, GA -- Nordic Logistics and Warehousing has doubled capacity at its Savannah location, holding a ribbon cutting Friday for a new 200,000-square-foot cold storage and blast freezing facility. "Exactly three years ago, Nordic opened its doors here in Savannah to give our customers the logistical advantages that come with one of America's most efficient ports, combined with the superior connectivity of Interstates 95 and 16," said Don Schoenl, President and Chief Executive Officer of Nordic. Nordic, a member of AGRO Merchants Group, LLC, opened its initial 200,000 square-foot cold storage warehouse in Savannah April 11, 2013. Nordic's Phase I facility has exported over half a million tons of frozen food since its opening. Atlanta, GA -- Gov. Nathan Deal today announced that HD Supply Holdings, Inc., one of the largest industrial distributors in North America, will create 500 new jobs and invest more than $100 million in Cobb County throughout the next 5 years. Savannah, GA -- The Port of Savannah has added Peruvian avocados to its expanding portfolio of perishable goods. "Importing avocados through Savannah was a first for Mission Produce, and for the avocado industry," said Jose Maldonado, Director of Global Logistics and Transportation for Mission Produce. "During the Peruvian season, we brought containers through Savannah to give us quicker access for our customers in the Southeast." With farms located in the La Libertad region, near the city of Chao in Peru, Mission Produce ships avocados to the U.S. from May through September. "Adding Savannah as an import location to serve the Southeast means fewer road miles, lower transit costs and fresher produce," said GPA Executive Director Curtis Foltz. "Garden City Terminal's refrigerated cargo infrastructure is unmatched on the U.S. East Coast." Savannah, GA -- The Georgia Ports Authority handled a total of 321,094 Twenty-foot Equivalent Unit (TEUs) containers in October 2015, an additional 9,335 units, or 3 percent increase over the same period last year. For the fiscal year to date (July-October), the GPA has moved 1.27 million TEUs, up 74,754 units, or 6.2 percent. "Month over month container volume growth continues to outperform expectations," said Foltz in his report during GPA's board meeting Monday. "Inflated volumes in 2014 due to West Coast cargo diversions are beginning to return to normal levels. We are optimistic consumer spending in the U.S. during the upcoming holiday season will lead to volume growth going into 2016." Also during the November meeting, the Authority approved $12.75 million in spending for a 63-acre expansion of the Port of Brunswick's vehicle storage area. "The growing strength of the Southeastern U.S. market, combined with increased market share at Georgia's deepwater ports, have required a steady increase in capacity in both Savannah and Brunswick," said Jim Walters, GPA's Chairman of the Board. "The action taken by the Board today will serve as a strong sales tool to prospective customers." San Antonio, TX -- Port San Antonio is working hand-in-hand with its customers and public partners as it leads an effort to add 5,000 new jobs at the large industrial complex by 2020. Port President and CEO Roland Mower unveiled the ambitious goal to business leaders and public officials at the annual State of the Port briefing, hosted by the West San Antonio Chamber of Commerce. To achieve this goal, the organization’s priorities will focus on ongoing modernization of the former Kelly Air Force Base property and further growing the Port’s strategic collaboration with its customers as they pursue important opportunities locally, nationally and globally. Savannah, GA -- Trident Seafoods has opened a $40 million production and distribution center in Carrollton, Ga., providing 175 full-time jobs and the capacity to produce 50,000 tons of finished products annually for the U.S. market. "We are excited to add Trident to our family of customers, especially within the valuable refrigerated cargo market," said Georgia Ports Authority Executive Director Curtis Foltz. "This is an important win for Georgia, and for the Port of Savannah." Savannah's Garden City Terminal offers 84 refrigerated container racks and 814 chassis plug-ins, powering 2,830 refrigerated boxes at a time. Another 20 racks should be complete by the end of the year, adding 480 refrigerated container slots. Savannah, GA -- The Georgia Ports Authority moved a record 3.66 million twenty-foot equivalent container units in Fiscal Year 2015, an increase of more than half a million TEUs. "The deepwater ports of Savannah and Brunswick are cornerstones of Georgia's success, and major factors in creating new jobs and prosperity across the state," said Georgia Gov. Nathan Deal. "The wave of economic impact created by our logistics network supports virtually every industry, from manufacturing and agriculture to mining, distribution, technology and transportation." Strong performances across business sectors also led to records in total tonnage and roll-on/roll-off cargo in the year ending June 30. Valdosta, GA -- The Valdosta-Lowndes County Development Authority (VLCDA) continues to see the growth of Valdosta-Lowndes County businesses with expansion of existing companies driving both investment and job growth resulting in $27.25 combined capital investment and 95 direct new jobs. Robin Hood Timber and Landscaping Products Inc. an agribusiness company with a full assortment of commodity soil, bark and cypress mulch, will expand its landscape product manufacturing operations in Lowndes County, creating more than 50 new jobs over the next few years. The production facility located at what previously was ABS Greenworld was purchased to support the company’s growing marketing and sales base in the Southeast, North Florida as well as several Northern states. Ring Container Technologies the industry leader in the design and production of lightweight, high performance PET (Polyethylene Terephthalate) and HDPE (High Density Polyethylene) containers invested $10,000,000 to install new automated equipment in 2015. Ring Container Technologies is one of the largest plastic container manufactures in North America and focuses on finding sustainable solutions for the consumer packaging industry. Savannah, GA -- Konecranes will deliver 10 all-electric Rubber Tired Gantry (RTG) cranes to Georgia Ports Authority in the US. The RTGs will go into service at Garden City Terminal, Port of Savannah. With this delivery, scheduled for the summer of 2016, the Port of Savannah will operate a total of 146 Konecranes RTGs. Savannah, GA -- The Georgia Senate unanimously passed legislation Tuesday that dots the "i's" and crosses the "t's" on the $706 million Savannah Harbor deepening project. Savannah, GA -- A silver Hyundai Genesis rolling down the ramp of the Wallenius Wilhelmsen vessel Isolde became the 5 millionth vehicle handled by International Auto Processing at the Port of Brunswick.